This is something that I have been wanting to post for awhile since it has been so helpful to me. I (like many people I’m sure….I hope…) get so busy getting other things done and thinking of a million and a half things that by the time supper rolls around, I don’t have anything planned. So many nights have consisted of whipping up something quick simply because I don’t feel like making something or it’s too last minute to thaw out chicken or anything else for that matter! This means many nights of “Lets just do spaghetti…” or “Lets go out to eat instead.” Which means it either starts to get boring making the same ol’ thing or costly by going out to eat more often. So I finally discovered a routine that really helps me with this problem so I want to share it! I’m sure I am not the only person who does this but I wanted to get it out there anyway! I must admit, this does take a little bit of organization but it really will save you in the end! 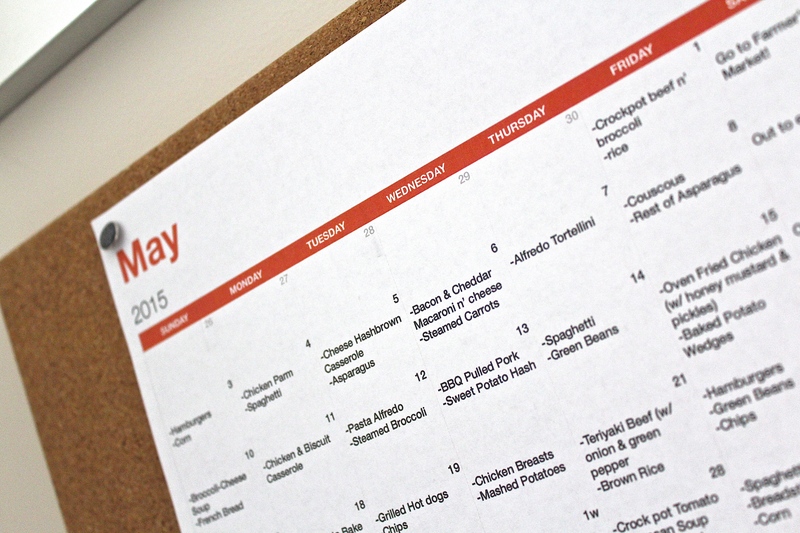 I started making these monthly dinner menus a few months ago and my husband and I LOVE it! I think some people may think this is crazy and that’s okay! But for me and my family, it really works! I type up and entire month of meals planned out for each day. Including everything: main dish, sides and vegetables. I do this at the end of each month so then just a few days before the new menu begins I do one big grocery trip. It DOES feel like an expensive trip but I find myself not having to go to the grocery store every other day for certain meal items. I do still make quick trips now and then for fresh fruit, milk…things that just don’t really last a whole month. When I plan out a menu I take an evening to sit down and pull up all of those amazing looking Pinterest recipes that I have been wanting to try! Whereas, if I am just trying to make dinner plans last minute, chances are I am not going to try something new or even have all of the stuff for it. I also get super frustrated when I have to go to the grocery store a million times because I forgot something for a recipe (okay this still happens, who am I kidding! 😛 ) so planning ahead of time, looking at recipes and making a grocery list for everything really cuts down on this a lot. – Leave Saturdays (or whatever day you have open and like to splurge) open for pizza, going out to eat or anything else fun your family likes to do. – Take leftovers into account. If your family likes leftovers leave days after larger meals open for leftovers. I don’t usually plan for leftover days since it works out really well for my husband to take leftovers to work for lunch. – Don’t plan huge meals that make lots of leftovers multiple days in a row, spread it out. – Still plan for quick n’ easy nights like simple pasta or grilling burgers. For example, when I make lasagna I make the sauce homemade and have lots leftovers. So we will freeze serving sizes in ziplock bags to take out and quickly make up spaghetti or a pasta bake another night. – Add new recipes you’ve been wanting to try to your menu. – Add a vegetable to your menu for each day. I feel like by having a particular vegetable actually planned makes it way easier for me to have vegetables each night. Otherwise I find myself saying, naaa we don’t really need it! This is extra helpful for me since I want to be setting a good example for our 1 year old! – Switch things around! There are times when my husband has to work late so we will just switch what we had planned with something simpler from another night. Make sure to still stick with it though or it is easy to fall out of taking the time to make the menu and follow it. Hopefully this helps some of you the way that it helps me! After saying “Wow, I really need to get this kitchen more organized!” about a million and a half times, I finally did it! Well…mostly my pantry! I’ve really been trying to keep our kitchen more organized in general because it is a huge pet peeve of mine to have things all over the counters all of the time (even though things tend to accumulate on the counters anyway). 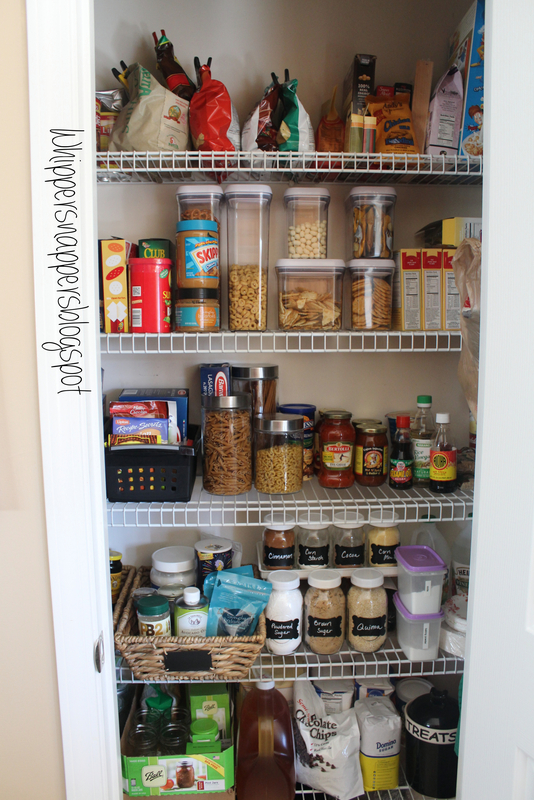 However, the main thing that needed some major organizing was our pantry! Oh man…opened boxes all over, things piled, baby cereal and snacks all over the place, extra canning jar boxes scattered all along the floor…just a disaster! I feel like it is so easy to throw something back in the pantry when you’re done with it instead of keeping it orderly so I finally decided to completely reorganize to make it much easier to keep things looking nice. I bought some OXO containers to keep boxed snacks, chips, cereal or whatever in. You can get them on Amazon, Target and most places but I was actually lucky enough to stumble upon them at TJMaxx for much cheaper, score!! I also used mason jars to put baking stuff in such as cocoa and corn starch. 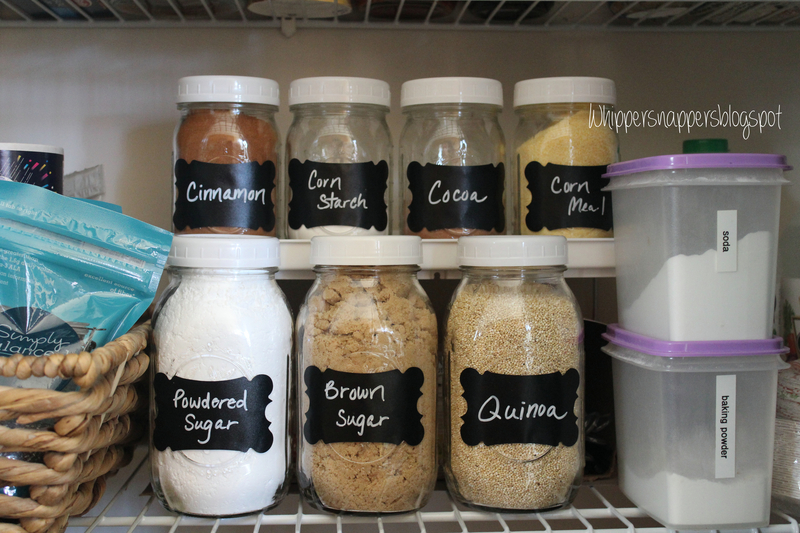 Not only does this keep it more organized and fresh but it is way more cute than all of the random containers! I then used chalk labels and a permanent chalk pen to label them. I used our old flour/sugar canisters for pasta. We use a LOT of pasta so it is nice to have it right there in a convenient container. I put additional different types of pasta boxes in a pull out tote (which can’t really be seen towards the inside of the pantry) as well as another pull out tote with small things like taco seasonings, tuna, etc. Below that I used baskets to organize jars of things such as coconut oil, cooking spray, etc. I stuck canned good in towards the inside ends since we don’t use those as much. For some reason I am obsessed with chalk board stuff! So awhile back I got this small little chalk board that has a little stand on it to put on our kitchen counter. 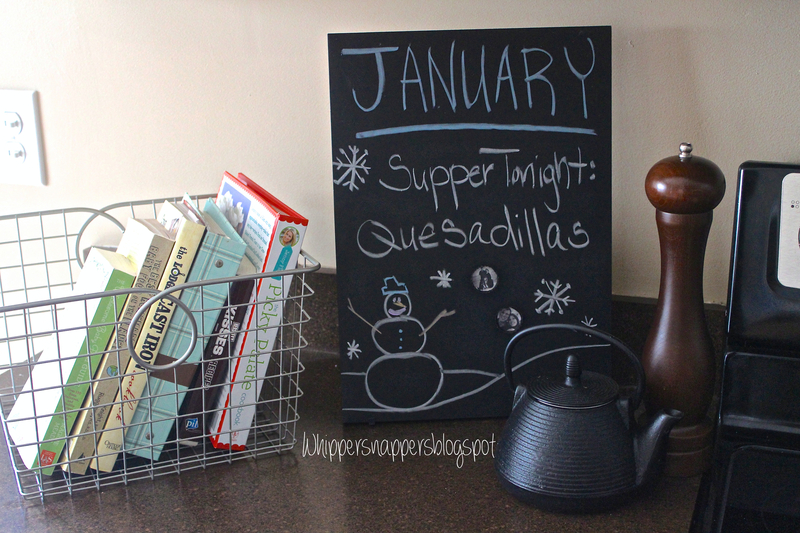 Sometimes I decorate it for the holidays, but much of the time I like to write our supper menu on there! I love the colorful look of all of our cookbooks so I never liked them hiding away in the cupboard. I found this wire basket to display them in, plus they’re easier to grab!